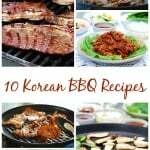 Here’s another Korean BBQ option for your summer grilling! 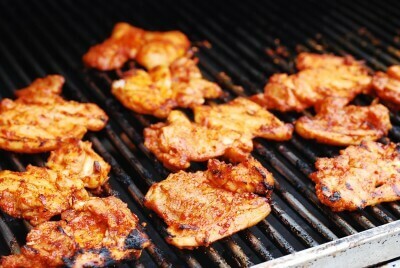 This spicy chicken bulgogi recipe is so flavorful, and I am confident that it will become one of your grill favorites. Not a spicy lover? Not to worry! 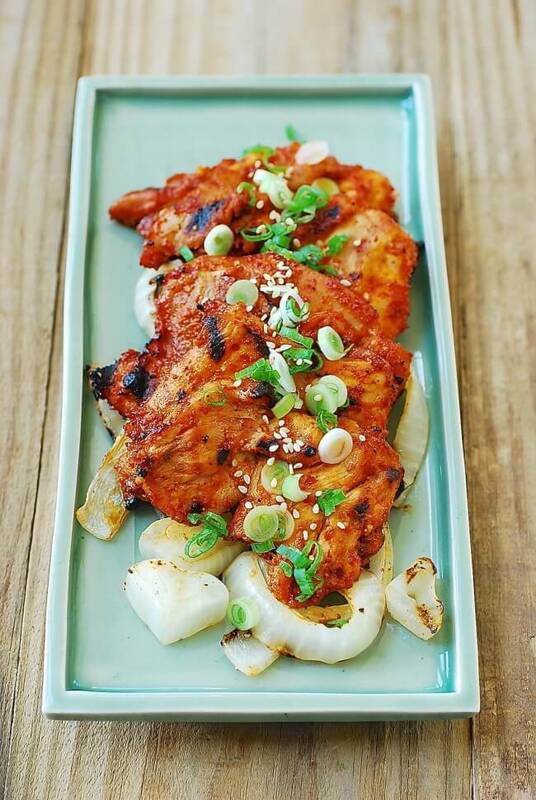 I already have a mild version of this chicken bulgogi recipe, which, by the way, is one of the most popular recipes on my blog. The dark meat stands up better to the bold marinade in this recipe. Boneless thigh meat is my favorite chicken part for grilling. Its open, flat surface works well for marinating and grilling. In Korea, deboned drumstick meat is also popular for similar dishes. Keeping the skin is a matter of personal preference. As a sweetener for the marinade, I used Korean plum syrup called maesil chung (매실청) in addition to honey and sugar. It adds a bit of acidity and fruity sweetness to the dish. Other options are pineapple juice or lemon juice with a bit more sugar. Grated apple works well too. 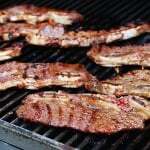 The marinade can be made 2 to 3 days in advance. 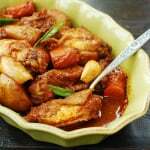 Marinate the chicken overnight for best results. On another subject, if you haven’t seen it yet, here’s the video of my first ever cable TV appearance! You can imagine how nerve-racking it was, but it was such an honor to be on a Korean cable network to share my stories about this blog, Korean food, and my readers. All the tableware shown in the final photos of this post are sponsored by Huue Craft, an online store dedicated to the finest Korean pottery tableware. They ship worldwide to over 25 countries. Please visit Huue Craft online store and check out their beautiful tableware! 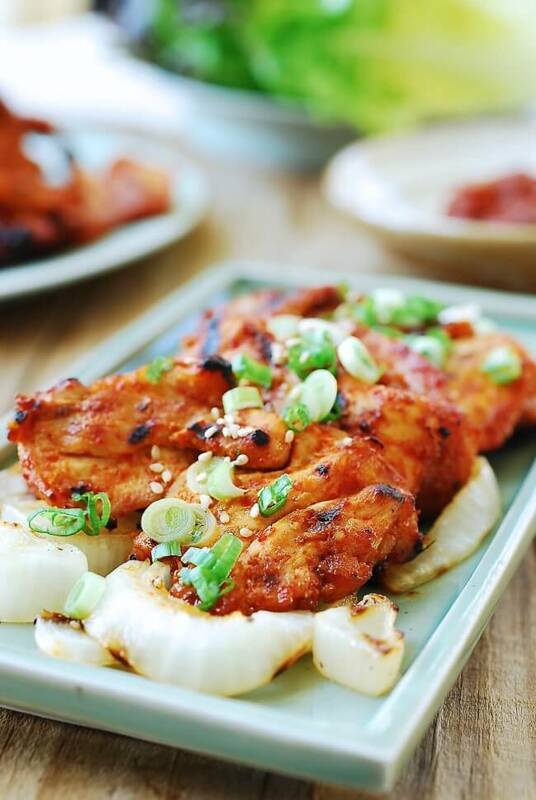 Chicken thighs marinated in a spicy, flavorful Korean marinade and grilled to perfection! Rinse chicken pieces. Drain. Trim off excess fat. 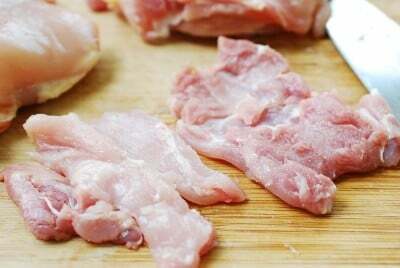 Cut each chicken thigh in half crosswise. Cut open any thick parts. Combine the marinade ingredients in a bowl and mix well. Coat the chicken with the marinade. 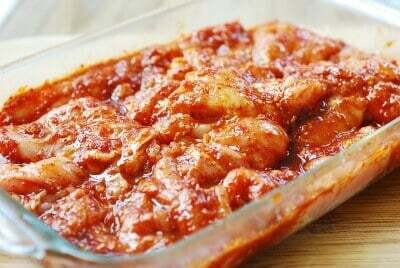 Marinate for a few hours (preferably overnight) in the refrigerator. Preheat a lightly oiled grill over medium high heat. When hot, add the chicken pieces. Cook until cooked through and slightly caramelized, about 4 to 6 minutes each side. Reduce the heat if the chicken starts to burn. 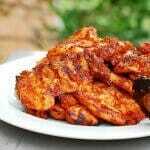 You can also cook the chicken indoor on a grill pan or in a skillet. Grill some vegetables such as onion, zucchini, and/or mushrooms. Simply cut up, toss with some sesame oil and sprinkle with salt and pepper before grilling. You will have an easy side dish to serve with the meat. This recipe looks scrumptious! I will try it for the 4th of July celebration! Again, I love all your recipes! Thanks so much for sharing them with us! My brother and I are marinating the chicken as we speak! We are so excited to try out this recipe of yours!! Awesome! Hope you enjoyed it. Well, the recipe turned out to be a big success! We cooked it in a cast iron pan and it was delicious!! The spice level was just right. It had a great kick without being too overpowering. We had a big dinner with my Chinese family, including my 94-year-old Grandpa. He took seconds of the spicy chicken! Nice!! Thanks for trying it out and letting me know how it turned out. Hope you find many more delicious recipes on my blog. 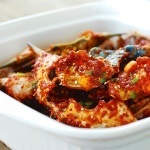 The recipe looks divine, Hyosoun!I would love to learn more about Korean cuisine and I am glad to have found your blog! 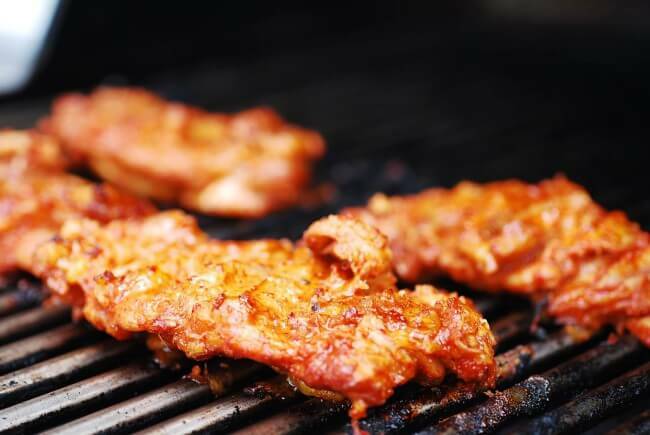 Have you ever heard of using this marinade for pork ribs? My mother-in-law used to prepare them for our beach BBQs but it has been a while since I tasted them and I never was able to ask for her recipe. She is a wonderful cook, I just moved far away and wish she could teach me more Korean recipes. I think I will try with chicken first and see if the flavor matches what I remember. Either way, I’m sure this is going to be delicious. Thank you for sharing. I just wanted to confirm the recommended amount of the sweet ingredients. Just looking at the amounts, t seems like the marinade would be really sweet. Thanks. Yes, it’s correct. The sweetness will help balance out the spiciness and saltness. Hope you try it! Thanks! 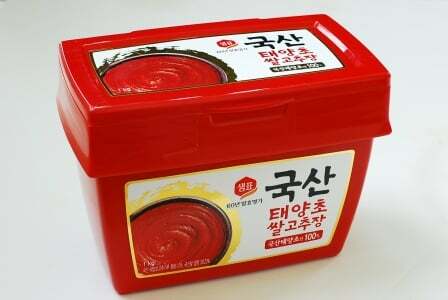 I’m going to do a test run tomorrow and if it turns out well, I’m planning to make it for my picky Korean dad ? 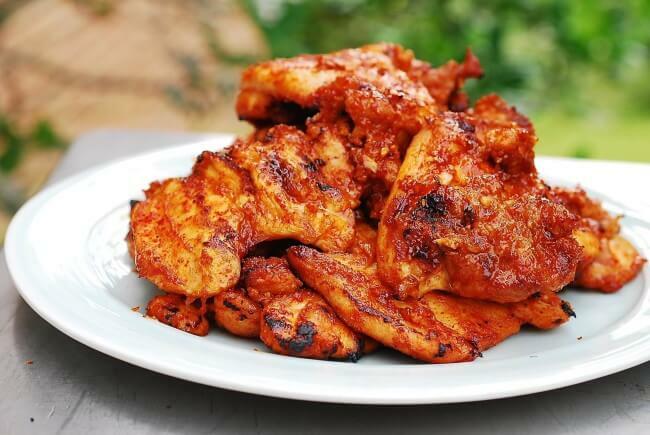 This looks like a dish I’ve had in Korea called Sut Bul Dalkgalbi (charcoal fire chicken galbi). It’s a variation of traditional Chuncheon-style Dalkgalbi. Yes, it’s a similar dish. Fantastic. I’ve eaten alot of this dish in restaurants and thought this recipe was perfect. Awesome! that’s great to hear! Thank you so much for letting me know! This will be the first Korean dish I make. I am marinating the chicken right now. This looks amazing!!! I have already picked out my next three dishes I will be making from your recipes! Thank you for sharing!!! Welcome to Korean cooking, Angela! I hope you enjoyed this dish, and also hope those three dishes you picked out turn out well too. I tried this recipe and it was really delicious. Everyone in my family liked it. Now I can’t wait to try your other recipes. Thank you! Awesome! Thanks for letting me know. Hope you fine many more recipes you like. Made your Korean Babsang, excellent, my family requested it for tomorrow’s diner. Looking forward to more of your recipes. My wife and I made this on our new indoor table burner and Korean grill pan. It was amazing! I can’t wait to try some of your other recipes. 🙏 my Korean daughter in law said this tasted really authentic when we had a dinner party for friends who had lived in Korea. Excellent recipe! 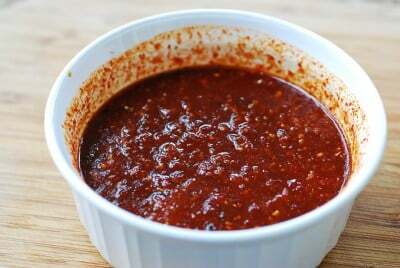 I used 1 tablespoon less of the Gochugaru and gochujang, and it tasted marvellous. Thank you! 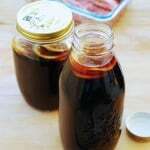 How long can i keep the sauce i made in refrigerator? Just found this, chicken is marinating and I’m serving with an Asian style mango coleslaw, sounds delicious and should have way less calories than my favorite Korean fried chicken. What kind of rice wine or white wine should I use? Thanks for your recipe. You’re welcome, Dee! Anything you have or you can easily find. Mirin (or mirim) is good too if available. Hope this helps! I finally made this dish yesterday with Kikkomman Aji-Mirin. It was very delicious but too spicy for me, so I added 1 cup of cabbage & 1/2 cup water. Unfortunately the whole dish becomes sour. I wonder what happened? I’m a novice cook who loves your recipe.